"Even though I didn't know any of the 2,000 men and women of Ryde that served in World War I, I feel a certain attachment as they lived in my street, or around the corner or up the hill". Those are the words come from the Foreword written by Bernard Cox, Ryde District RSL Sub-Branch President, as published in the Ryde District Historical Society's publication Ryde Goes to War. Mr Dominello goes on to say :... It is a quote that powerfully vocalises the sacrifices of our diggers. The quote from our Ryde goes to War book was mentioned as part of his RYDE ELECTORATE ANZAC EVENTS speech. The Australian Parliament is told of our "Ryde goes to war" Project and Book Launch! The Ryde District Historical Society was thrilled to learn that our local Member for Bennelong, Mr John Alexander, OAM had issued a Media Release of his speech to the Australian Parliament on 29 May 2015. Report of book launch as reported in The Weekly Times, 19 May 2015, p.8. 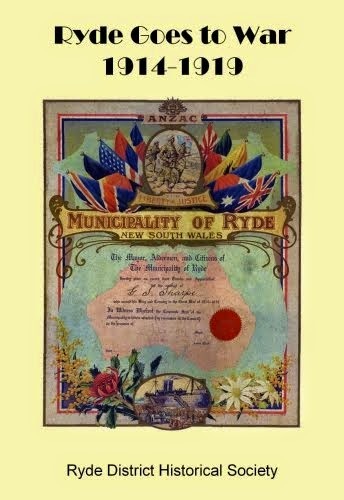 The Ryde District Historical Society is pleased to announce that their latest publication, Ryde Goes to War 1914-1918, was launched by the Hon. Victor Dominello MP, Member for Ryde, at Willandra on Saturday 16 May. Copies of the book are now available for purchase at $30 (AUD) plus postage $15 (for up to 2 copies within Australia; please enquire by email to rdhs1@bigpond.com for postage to any other locations). An order form is on the left column of the blog. The contents list is also available to preview, in the left hand column. at Willandra on Saturday 16 May. Descendants, families and friends joined Society members for the occasion. Week 23 : 18 March 2015 - The Northern District Times, page 23 - told the story of Sister Nellie Hill. Nellie Frances Hill was born in Hay, NSW in 1883. The sixth of the nine children of Henry & Catherine Hill. The family moved to Denistone House, Eastwood (now part of Ryde Hospital) in the early 1900s, where her father Henry died in 1912. By the time Nellie enlisted in 1914 her mother had moved to Epping. Gwynne were on the same voyage. Nellie was promoted to Sister in December 1915. She undertook extensive service in the field as a theater sister in casualty clearing stations and hospitals on the Western Front. Her younger brother Richard William Hill (SERN 27347) enlisted in 1916 and served on the Western Front. Sailor Tom Gascoigne had joined the Navy in 1912. Ton Gascoigne was the son of the pioneering family who had a large family estate at Putney on the Parramatta River. Joining the Navy in 1912 as Ordinary Seaman, he served on the HMAS Cerberus until he was assigned to the HMAS Sydney in June 1913. He was part of the Australian mission to destroy the radio station Rabaul at the beginning of the war. Promoted to a Able Seaman in October 1914, he was serving as a gunner in the victorious battle with the German light cruiser Emden when he lost a eye. It also ended his navel career but not his sense of humour which show through in this letter to family from Colombo Hospital. A brief outline of his story was published in the weekly Ryde Remembers column. Gladesville carpenter, Wallace Park was "a good and noble son". Week 21 : 4 March 2015 - The Northern District Times, page 21 - the story of Private WALLACE PARK, Service No. 2253. Wallace was the son of well-known stonemason and builder James Park, He attended both Gladesville and North Ryde Public Schools before training as a carpenter under J.J. Dakin. In June 1915 he enlisted and arrived on the Gallipoli Peninsula on 6 August with the 6th Reinforcements of the 2nd Battalion. Two days later his status was listed as wounded in action during the Battle for Lone Pine. A Red Cross enquiry later updated his status to Killed in Action on August 8 1915. His family's great sadness was turned into many memorials, the most well known being the Wallace Park Memorial Classroom at the Presbyterian Church of St Andrew in Gladesville, which was donated an built by his father and opened by his mother in May 1917. Tolkien reading day, March 25. Ryde District Historical Society Inc.
Ryde District Historical Society Inc.. Simple theme. Powered by Blogger.